Heinrich Himmler had a uniquely sinister role in the Nazi regime. As leader of the SS he oversaw the camps that exterminated people seen as threats to the Reich, first among these being the Jews, of course. When Hitler launched his war of annihilation against the Soviet Union Himmler’s men followed the regular army, killing civilians left in its wake. He was chief of the Gestapo, the secret police that spread terror throughout occupied Europe. As the war escalated his power grew, bringing military intelligence and army units – the notorious Waffen-SS – under his command. When the Allies broke through its borders Hitler trusted him with the defence of the Reich itself. 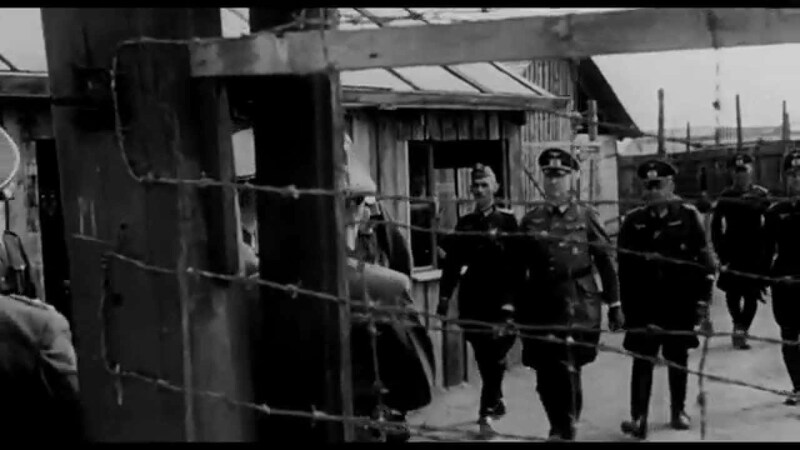 Vanessa Lapa’s film sets out to show us something new about Himmler and the influences that shaped him. It follows a straightforward path, taking us from his childhood home in Bavaria and rise through the Nazi ranks to the peak of his power as Reichsfuhrer-SS, his eventual capture by the British and death while awaiting trial. It’s less a search for new answers than a fresh perspective on old questions. How could a physically weak and socially awkward agriculture student with no experience of police work, intelligence gathering or active military service reach such a position? What kind of man was this? Like many Nazi leaders Himmler chose to kill himself rather than face the Nuremburg Trials, so we never got to see him stripped of his powers and made to account for his actions in court. Many who look at detailed accounts of the Nazi leaders will be struck by something like the following thought: the more you learn about them the more monstrous, less human they appear: the nearer you get the more distant they are, or so it seems. The Decent One aims to bring Himmler close, to restore him as a real man so to speak. To achieve this the film draws on a collection of personal letters, photos, and diaries seized in a raid on the family home by US troops in May 1945 but which disappeared from public view for decades, resurfacing only recently. It’s become something of a convention with war documentaries that we’re accompanied by a narrator, often a familiar voice from epic dramas. Actors who guide us have included Orson Welles and Charlton Heston, more recently Tom Hanks and Meryl Streep. Arguably the high point of this approach was marked by Laurence Olivier in the outstanding 26-part series The World at War, produced by Thames Television in 1973. By contrast, in The Decent One the only words we hear are from the records, spoken by actors: we’re alone with Himmler’s voice. Perhaps the most obviously troubling aspect of the film is its title. On the face of it wildly inappropriate, crudely manipulative, what’s going on here? It becomes more understandable when we consider the great importance Himmler attached to decency: his speeches and writings are full of it, even while he urged his subordinates to mass murder. Decency was a key Germanic quality, he thought, one he demanded the SS live up to, but what did he take it to mean? According to historian Peter Longerich he connected it to purity and chivalry, behaviour that was generous and understanding, free from selfish motives. There’s an important qualification to all that of course: virulent Aryanism. It was necessary ‘to be honest, decent, loyal, and comradely…to those of our own blood and to no one else,’ he told a gathering of Nazi leaders at Posen in 1943. All this is a matter of historical record, but the film offers us a new, more intimate perspective on Himmler’s ‘own blood’: a view from inside his family. We hear his profoundly gloomy wife Margarete hoping he isn’t working too hard, and his young daughter Gudrun missing him when he’s away, for example. It all sounds remarkably normal if we suspend the thought that what takes Himmler so far away working so hard is mass murder on a scale that barely seems possible, even now, after 70 years. We can recognise these glimpses of normality without any special effort or thought, and the overall effect is valuable in several ways. The film skilfully weaves together voices and images of personal relationships with the now familiar archive clips of deportations, concentration camps and executions, giving these a renewed power to shock. It sharpens our sense of disbelief at his actions, but it also reminds us that Himmler was human, even if he denied that recognition to so many others.